How f#cking sweet is that album cover? 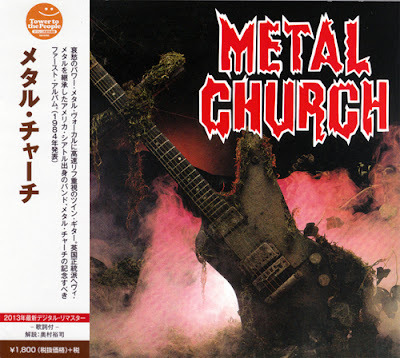 It's almost as epic and amazing as the music on the record, which should alone tell you how brilliant "Metal Church" is. In 1984, there was a trifecta of power metal albums, with the two others being Omen's "Battle Cry" and Jag Panzer's "Ample Destruction" (Though, there were several other fantastic records of the US power metal genre), but Metal Church's debut record makes those two legendary records seem nearly obsolete. This album is that damn great. 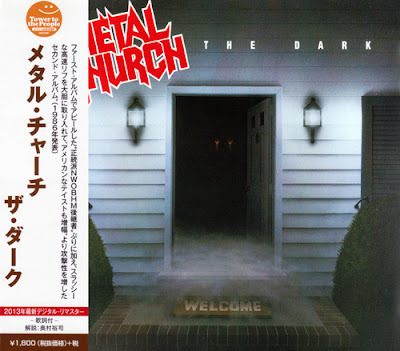 Every single aspect of what makes an album awesome is present here, from the vocals, the riffs, drumming, aura, and everything in between, there isn't a single complaint that could be made about these power metallers (They weren't a thrash band, despite the popular belief, which dictates that they are) and the flawless record that they created. 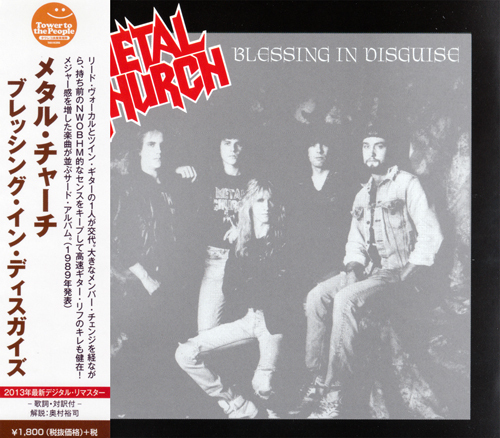 The riffs are insane, whether they're the thrashing ones on "Battalions" and the greatest instrumental ever composed, "Merciless Onslaught," or the simple midpaced ones that are prominent on the title track. There's simply no way to deny the catchiness of each riff, but you've got to give credit Kirk Arrington on drums, because his drumming is equally terrific. The fills that can be found on the intro to "Hitman," as well as the intense and thunderous rhythms on "Merciless Onslaught" make all of the riffs that much better. David Wayne's vocals are another fantastic compliment to the music as they bring a different feeling on just about every track. His clean singing on "Gods of Wrath" is top-notch and can be compared to some of the genre's best pure singers, while his fast-paced vocals on "Hitman" and "(My Favorite) Nightmare" are more like those of an early thrash band. In addition to the thrashier songs and catchy, simple power metal tunes, there are some much more epic tracks that blow away songs by the much more epic-styled European power metal bands. The album opener "Beyond the Black" begins with a stellar clean guitar introduction that serves as the backdrop to the sample vocals, before turning into a midpaced riff that is guaranteed to get your headbanging, as well as some incredible solos (Which is a common theme on this album, as every song has awesome solos). "Gods of Wrath" also switches effortlessly between clean passages and beautiful vocals, and heavy riffage that balances out perfectly. The description of Metal Church's debut album is nearly pointless, because the only thing that really needs to be said is that it is perfect and if you don't realize this, then you need to be burned and died immediately. Yes, that's right, 96%. This is an album where you can fast forward to any point on it, any point at all (except the slower part of Watch The Children Pray) and be guaranteed to hear a good riff. The guitars are produced perfectly which is really saying something considering this was 1986 and the riffs are excellent and also well-varied throughout the album, which even Reign In Blood cannot say about itself. The vocals are very shrieky, but i have to say that most 80's thrash album have something strange about the vocals, and in fact I prefer the bands who have the more unique sounding vocalists. Here we find a nice high pitched, very sharp and clean-sounding shriek. The drumming is well done overall and not overproduced, both of which can't be said for Metallica. 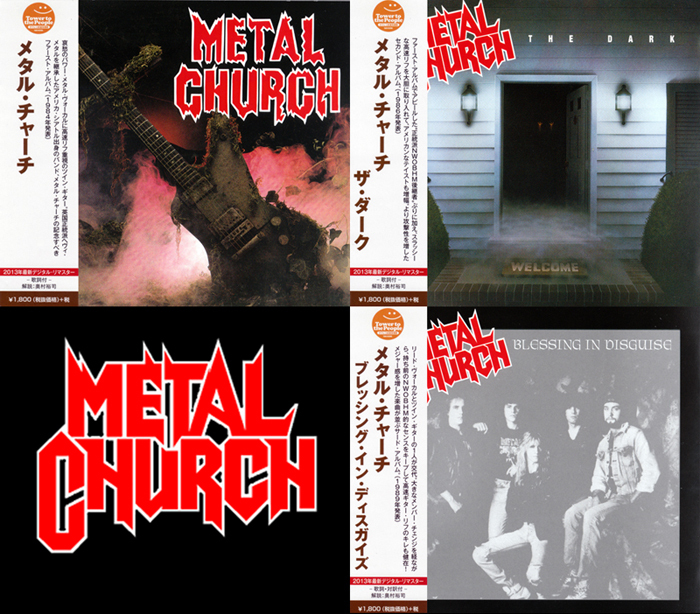 And voila, Metal Church have something on both of the two most famous thrash acts ever! There are not many guitar solos as on other albums and the ones present are above average but not excellent, but this album is one that does not feed off of soloing like some bands do (i.e. Judas Priest on Painkiller), rather here a solo is more of an added bonus, but the song is based a lot more on the riffs. Something else to mention is the presence of a slow ballad. Making good ballads is indeed a lost art and is much more difficult than it seems. In fact, around 80% of attempts at a nice and emotional ballad fail (see The Black Album). However, one of the best ones since Stairway To Heaven is found on here, that is Watch The Children Pray. It is a must-hear, and my words will not do it justice. My two other favorite songs are Start The Fire and Western Alliance. I would place this in the top 10 all time for thrash albums without question!!! Not my rip, not my scan-job. 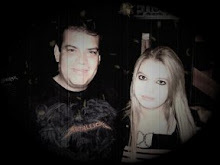 Thx very much to the original uploader Ilijan [MMT]!